For Ryan’s Halloween party back in October I made little Frankenstein cupcakes to send in. Chocolate cupcakes topped with green buttercream frosting and brown sprinkles to make a funky little treat. A few weeks ago, I told Ryan I was making green muffins. “Frankenstein cupcakes? !” he asked. Uh, no, sorry kiddo. Instead, I was making some spinach packed treats – but he didn’t need to know that. Although I informed him that, unfortunately these would not be chocolate-y desserts, he was still intrigued. Thankfully, as soon as they came out of the oven their green color and familiar shape was enough to get a taste. And what a win it was – and I was a happy momma! The thing is, these baked “treats” are packed with spinach puree. 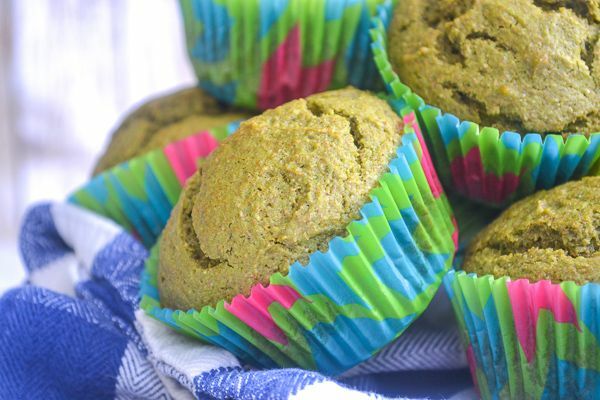 With zero refined sugar, whole wheat flour, and a ton of greens, you can feel good about feeding this kid friendly muffin to your kids any time of day. Since making them I’ve served them for breakfast, as an easy snack, along side their favorite lunches, and even as dessert. How do you make spinach muffins? Stir together puree, oil, eggs, vanilla, and syrup together and set aside. Combine remaining ingredients in a large bowl, whisking to disperse evenly. Gently stir the wet ingredients into the dry ingredients until just combined. Do not overmix! We want as minimal gluten development as possible. Line a muffin tin with paper liners if using and scoop batter in. I like to use a larger spring-loaded ice cream scoop to ensure they’re all even. Bake for 18-20 minutes in a 350 degree oven or until a toothpick comes out clean. Feel free to use the flour you have on hand. I used whole wheat because it’s what I had and I wanted to get rid of it. Use AP flour or white whole wheat (my favorite) as you wish. You could also sub in 1/4-1/3 homemade oat flour! I used maple syrup, but I’ve used honey in the past. Remember that babies can’t have honey until after 1! You could also easily sub in granulated, brown, or coconut sugar. Use what you have! While I used spinach in these, you could sub just about any other veggie puree here. Carrot would be great, (or try out these super easy carrot muffins!) as would pea or butternut squash. You might need to play with sweetener a bit if you’re using a sweeter veggie. 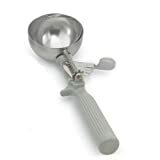 The BEST way to scoop batter is using a spring loaded ice cream scoop. (I’ll link the one I use below!) Just spray the muffin tin and scoop the batter in. This way all of the muffins are the same size and bake evenly. I also use this scoop for pancakes! It equals about 1/4-2/3 cup of batter. I love using a spring loaded scoop for everything from muffins to pancakes to meatballs. Because I love them so much, I have a few different sized ones to make life easier, but this is the one I used here. How can you use spinach puree in food? Muffins. Obviously, this is my all time favorite. My kids will eat just about anything in muffin form – I’ve only have ONE failed muffin attempt and even then, they ate a few. Smoothie. Veggie smoothies are my close second. We have smoothies every morning, and this easy spinach smoothie is my go to. Pancakes. Kids love pancakes. In fact, I’m pretty sure it’s written in their DNA. These spinach pancakes use puree as the base and taste just like normal pancakes. Pesto. A weeknight dinner staple in our house, this veggie pesto sauce is simple and delicious. Bonus, get a serving of green in with it! Brownies! No one ever believes that these spinach brownies are packed with the green stuff. Need more convincing? Try out this post of 16 kid friendly spinach recipes. My boys LOVE them and there’s no, “ewwww” debates. 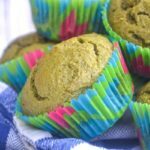 These green muffins are going to be a game changer ! 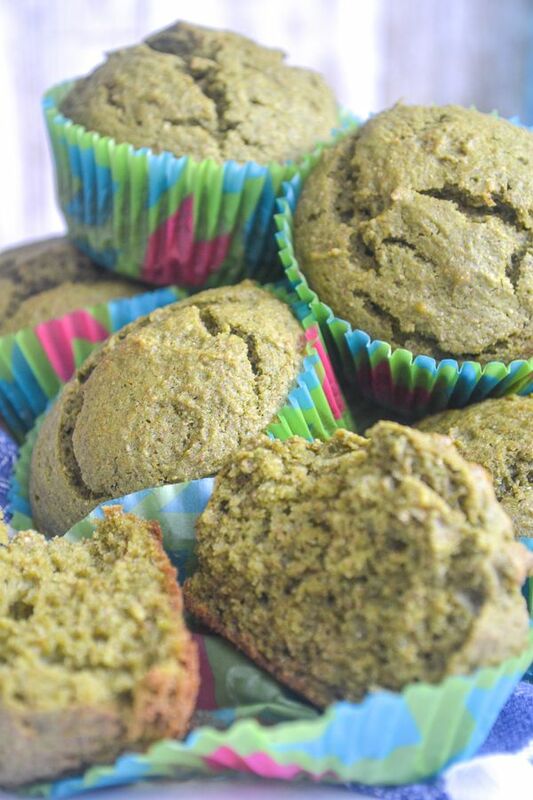 They’re a kid friendly favorite with no refined sugar, a dose of spinach, and whole wheat. Bonus: they make a super easy breakfast for kids on the go. If you enjoyed this recipe, please be sure to rate it 5 stars! 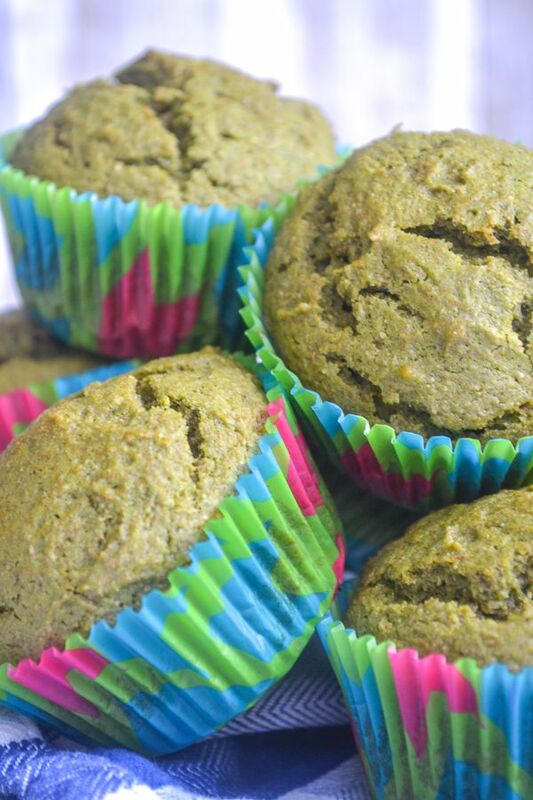 Spinach muffins are kid-friendly way to get a scary vegetable into little bellies. Sweetened naturally and packed with greens and whole grains, these veggie muffins make for a great snack or breakfast for kids on the go. Preheat the oven to 350 and add liners to a muffin tin. Combine all dry ingredients until smooth. In a separate bowl, combine the dry ingredients. Fold the dry and wet ingredients until just combined – do not over mix. Scoop into muffin tin and bake for 18-20 minutes or until a toothpick comes out clean. 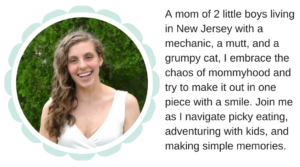 So, tell me – what’s something your kids love and will ALWAYS eat? Let me know in the comments!